Rain and fog then a chill, what about that Christmas snow? Fog could be as thick as your Christmas gumbo until a cold front passes through the area on Saturday. A second cold front will quickly follow bringing chilly temperatures in time for the holiday. Through Saturday: Dense fog will be the main weather issue until steadier rain arrives on Saturday. 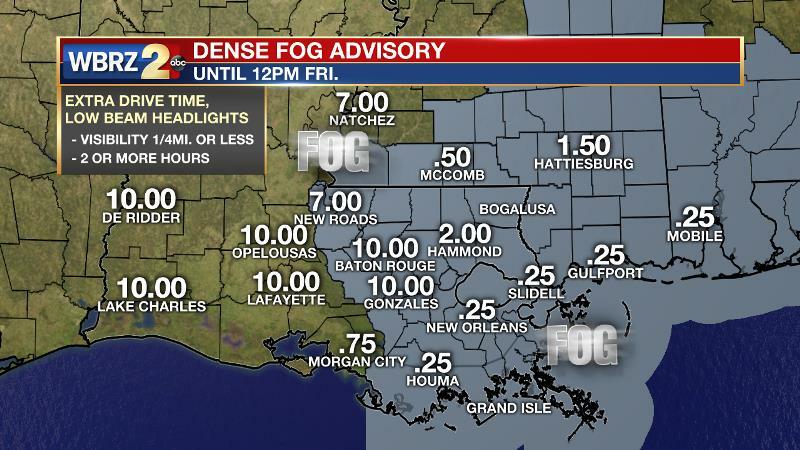 Due to warmer air passing over the relatively cooler waters of Lake Maurepas, Lake Pontchartrain and the Gulf of Mexico, “advection fog” – that is, fog created by transport of air, will reduce visibility to less than one mile at times. The most problematic areas will be those closer to bodies of water, especially the Gulf Coast. Remember to allow extra travel time and use low beam headlights when driving in fog. Friday will still be mild with high temperatures in the upper 70s. Some breaks of sunshine may be expected in the afternoon. Likewise, an isolated shower is also possible. The first of two cold fronts will push into the region Friday night, drastically increasing rain chances. Look for a period of rain, and possibly a few thunderstorms, to last through much of Saturday. The clouds and precipitation will keep thermometers in the 60s. Aside from the Baton Rouge area forecast, this storm system will slowly chug across the eastern third of the country and could create some significant holiday travel headaches, particularly on Saturday. Rain will stretch from New England southwestward to the central Gulf Coast, with snow in the major cities around the Great Lakes. The Western U.S. looks quieter. Christmas Eve and Christmas Day: The second cold front will race through the area Saturday night into Christmas Eve. This one will pass with little, if any, rain and will allow skies to quickly clear. Christmas Eve will be mostly sunny with highs in the upper 50s. Cold air will continue to spill into the area and by Christmas morning, many locations will be near freezing. Locations north of I-12 may even reach 32 degrees or lower. Despite ample sunshine, temperatures will struggle for the low 50s in the afternoon. 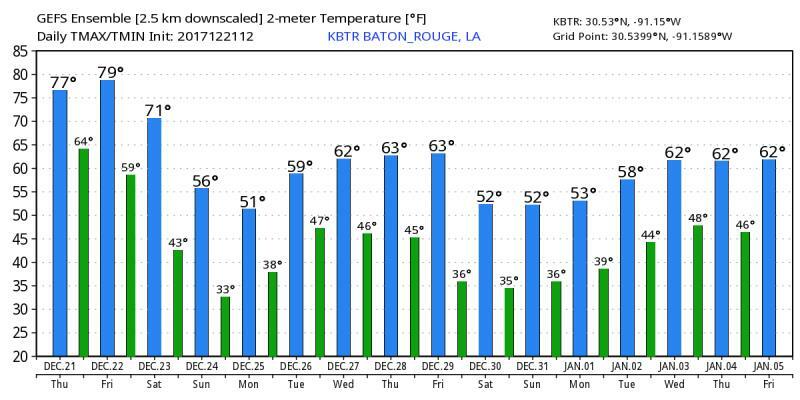 For many, that could be considered an improvement in the Baton Rouge area over record warmth from the previous years. 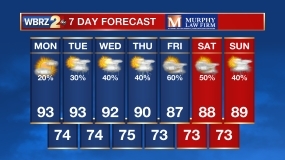 Looking Beyond: By Wednesday, another front approaching from the north will draw onshore flow from the Gulf returning clouds, fog and showers to the forecast. This front is expected to be rather sluggish. An upper level wind field parallel to the front will mean any forward progress will be difficult. This could mean another extended period of unsettled weather for the middle of next week. Long range forecast models are in good agreement that another chill will arrive for the final days of 2017 and early 2018. Editorial Note: Do you remember earlier in the week when some infamous area blog sites, weather enthusiasts and even some media were teasing out the possibility of another snow event around Christmas? 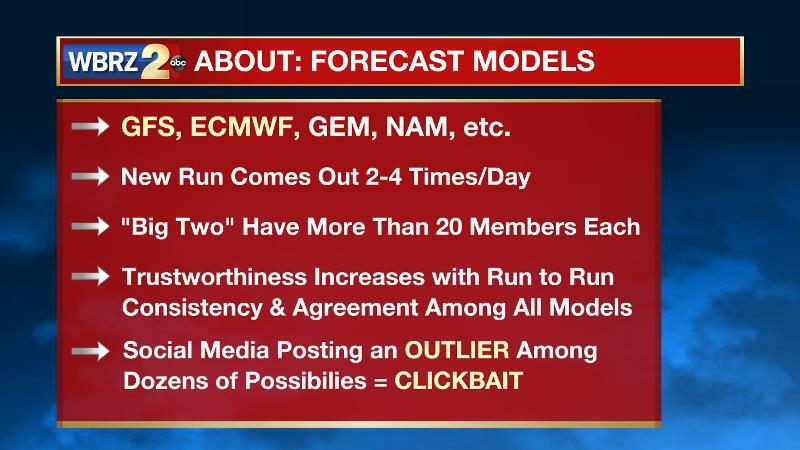 We cautioned once those model images started to hit the internet that the computers are far too unstable that far out to warrant excitement or alarm. Just remember, when your friendly neighborhood meteorologist says snow, or no snow, and the opposite happens, there is accountability. As a community, we should either hold the bloggers and “modelogists” to the same scrutiny or agree to put an end to premature weather hype. Scrooge you call me? Nay! Merry Christmas to all!